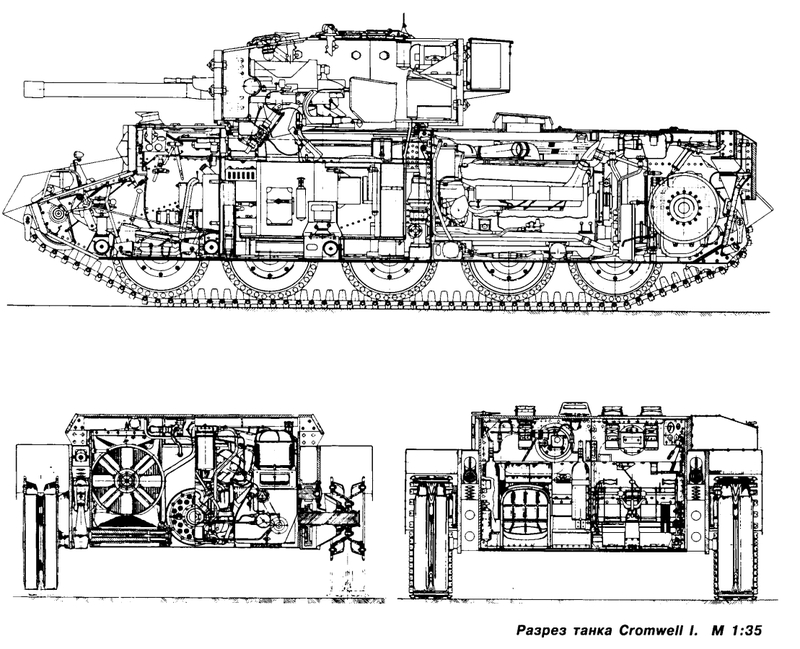 In mid-1940, the Directorate of Tanks and Transport issued specifications for several types of tanks which would be developed around the new QF 6 Pdr (57 mm) AT gun. These included the A23 Cruiser, a version of Vauxhall’s A22 Churchill infantry tank, and the A24 Cruiser, based on plans to replace the Crusader. For the latter, the two firms involved in the Cruiser Mk.VI project were contacted, namely Nuffield Mechanization & Aero Limited and Birmingham Railway Carriage and Wagon Company (BRC&W). Nuffield started working on the new project from the end of 1940, based on the expected new (410 hp) Liberty engine, 70 mm (2.75 in) of armor, and a larger turret ring to accommodate the 6-pdr. In January 1941, the Tank Board met and decided that the new cruiser should be ready for production by early 1942, and based on an existing design to short circuit the prototype phase, ordering Nuffield to build six pre-series vehicles of the new design. Nuffield worked on the A24 project, then known as the “Cromwell”, until the end of 1941, and the design was passed onto Ruston and Hornsby for the final mass-production. However, delays piled up considerably due to other commitments, including the conversion of the Crusader to the 6-pdr gun. Eventually, trials began in March 1942, revealing serious problems with the new Nuffield Liberty engine. These engine problems eventually led to a triple design, the A24 (with the old Liberty engine), A27L (with a redesigned Liberty engine) and A27M (Meteor engine), all named Cromwell originally, but renamed by the general staff as the Cavalier, Centaur, and Cromwell respectively, to avoid confusion. The A24 Cavalier was relatively similar to the Crusader in terms of size but completely redesigned in many points. First, the hull was made of homogeneous rolled steel plates, welded together with few bolted elements. The maximal armor thickness was raised to 3 inches (76 mm) on the front glacis flat plate. The hull nose was a sloped beak. The sides were also flat, but their thickness is unknown. The top and bottom were 20 mm (0.79 in) thick. The drivetrain comprised of a set of six rubberized large roadwheels, with rear sprockets and front idlers. The small track links were similar to the ones on the Crusader, short and relatively narrow. The track catwalks were occupied by four armored storage boxes, which acted as extra side protection. The exhausts at the rear were also covered and protected. The turret was brand new, roomy enough for three men to operate around the bigger 6-pdr gun L43. A real improvement over previous designs, as the new gun had an effective range of 1610 yards (1510 m), a 850 m/sec (930 yd/s) muzzle velocity (and 1,151 m/s or 1259 yd/s with 1944’s APDS rounds) and was capable of defeating 85 mm (3.35 in) of armor at 100 m (110 yd). The turret was boxy and six-sided, with an internal mantlet, and protected by 50 mm (1.97 in) thick bolted-on appliqué armor. This became a trademark for this 1942 Cruiser series. Secondary armament comprised two Besa machine-guns, one manned by the co-driver in the hull, the other coaxial, manned by the gunner. The internal compartmentalization comprised three modules (driver, fighting, engine), separated by bulkheads, fireproof for the engine, with an extra one separating the engine from the Wilson epicyclic Leyland transmission. Steering and braking were pneumatically assisted. For the rest, the relatively similar engine, internal arrangement and mechanical parts were all identical to the Crusader. The OP (Observation Post), used for spotting and reporting artillery range, equipped with a dummy gun, giving more room for the turret extra radios. The ARV (Recovery Vehicle) had its turret removed, and an A-frame jib and associated equipment fitted in. Both versions, contrary to the regular Cavalier tanks, served actively in the European theater in 1944. Due to their unsatisfactory engine, Cavaliers were used for training or auxiliary armored vehicle roles, being converted into the OP and ARV versions. By 1945, at least 12 Cavaliers were given to the Free French Forces of the 12th Dragoons. This was the only foreign user of the Cavalier. Due to a rushed design based on the already unsatisfactory Crusader powerplant, the Cavalier suffered badly from reliability issues and was stuck in Great Britain tank training schools for the duration of the war, a similar fate to that of the Covenanter. Standard Cavalier used for training in Great Britain, fall 1942. The Cavalier was basically an up-armored and redesigned Crusader. The engine and transmission as most of the technical parts were identical. The easiest points to distinguish the Cavalier from the Centaur and Crowmell are the redesigned rear (due to the transmission), positioning of the rear extra fuel tanks, and absence of the exhaust vent on the engine deck behind the turret. A24 Cavalier with mudguards, from a training unit in Great Britain, 1943. There is a mislabeled “Cavalier” at the Saumur Museum, with a beige-dark brown camouflage pattern and active units symbols, which in reality could be a Centaur or Cromwell CS. Since a few “Cavaliers” were donated to the French forces in 1945, this is probably the origin of the error. Cavalier OP (Observation post), Great Britain, 1944. Cavalier ARV (Armored Recovery Vehicle) in Holland, 1945.